Tomorrow’s Garden is Worth Visiting Today! 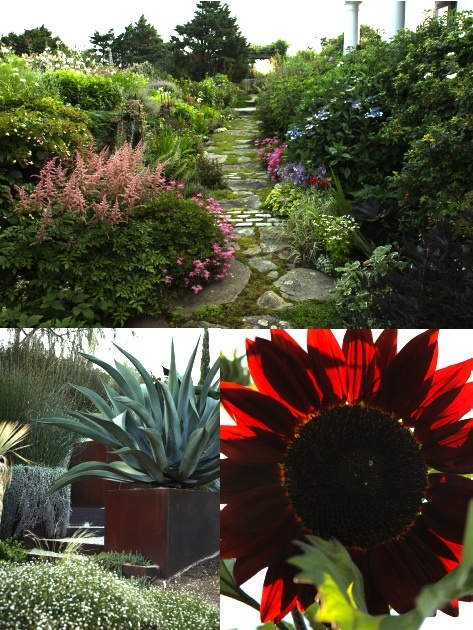 –Stephen Orr shares simple, yet inspiring ideas for almost any type of yard and gardener. The Los Angeles Times recently reviewed this landscaping book (click to read review), so for what it’s worth, I will share the outdoor living ideas that I found inspiring. Orr, who is Martha Stewart‘s garden guru and a longtime gardening editor, showcases gardens in 14 U.S. cities, and shows us how both landscape designers and amateur gardeners draw on the new “green” gardening practices without sacrificing their beauty. In fact, his book illustrates how these practices–recycling, permeability, reusing, restraint, repurposing, small scale, local resources–actually enhance the beauty and purpose of these outdoor spaces. Here’s a walkway of strips of stone filled with groundcover plants and stones in a San Francisco garden by Surface Design, which allows for rain to filter into the ground (permeability) instead of into storm drains and the ocean. Orr makes a strong case for using gravel in gardens, again to create permeability, but also for its visual and functional appeal. 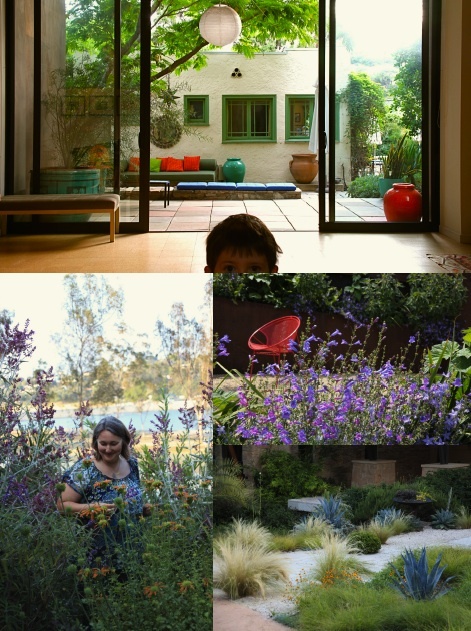 While Orr is not anti-lawn, he counsels readers to use it sparingly, “as an area rug.” His book provides details on the best types of gravel, how to install it, and ways to use it to create anything from a modernist Palm Desert look to the serene ambiance of a shady terrace in Provence. He devotes many pages to creative, resourceful gardeners who are including cast-off objects and materials in their gardens, such as this vertical pocket garden in Napa, California, by designer Emmanuel Donval, made out of metal roof jacks filled with water-saving succulents. The book has many examples of “repurposing,” such as this path of recycled chunks of concrete. 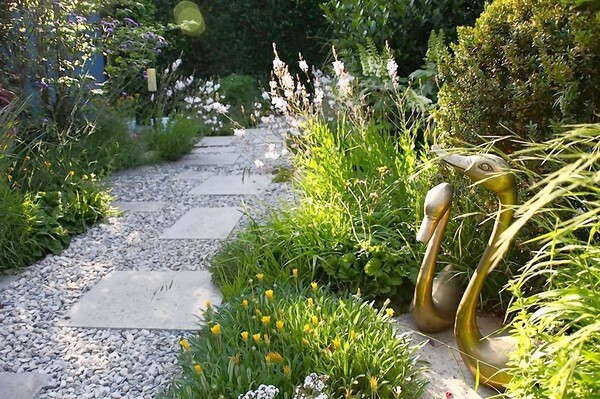 by designer Beth Mullins of Growsgreen Landscape Design. Orr provides many examples of how to soften hard edges with plants, and also how to add structure and focal points to contrast against looser plantings (a pair of/or single sculptural, brightly colored chair works like magic in many of the gardens in this book!) . Above is a Los Angeles garden by designer Jay Griffith. Would I buy this book? If I wanted some fresh ideas on how to imagine my garden, and to learn specific ways and tips on how to make it blend with my natural environment, YES! since Orr interweaves his personal gardening experiences and shares how his own thinking has changed over the years. Or you can just pick it up and refer to different chapters for specific tips or ideas. He confesses that after years of working on giant gardens for his upscale clients, that “the grandiosity of some of these private gardens began to unsettle me.” An admitted control freak, he talked about how you have to be “a little Zen” to go organic, and allow “for a few more imperfections.” I love that! In my opinion–as someone who is just learning about a lot of these new “sustainability” ideas–we will all be so fortunate if these really are Tomorrow’s Gardens! is available at Amazon for $16.49. Orr also will be giving a lecture about his book in Los Angeles (as well as other cities, such as San Francisco, New York and Austin.) on Wednesday, April 20. 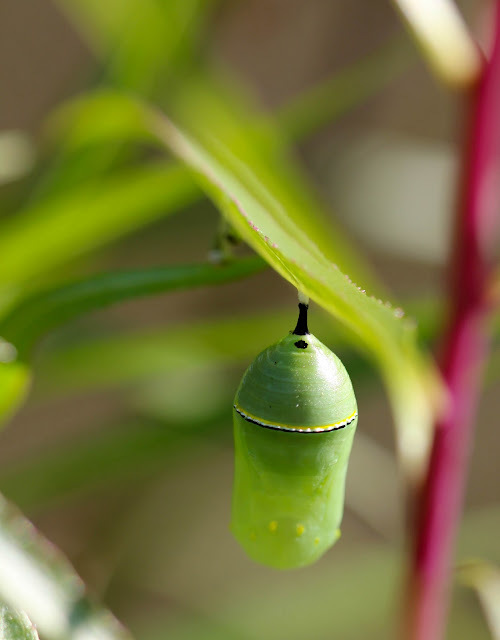 Next Post: Have You Marked Your Calendar for CA Native Plant Week? The grove of trees remind me of small/courtyard gardens in Italy and other Mediterranean countries. Love the modern take on a vertical garden, what an architectural feature! This book looks great! Thanks for posting the tip over on my bloggeroo. Must buy! Tx u for the book review! I hope tomorrow´s gardens be more organic and less chemicals. Sometimes is better if our roses have less flowers but more health. So excited that stephen wrote a book — i've been a big fan of his site for many years…glad he is with Martha now and happy to have something new from him. Just catching up on my blog reading and found this post. It's fabulous…so many great ideas and I love the quote you shared about him trying to honor a little more imperfection. I can relate! Every time I visit your blog I leave feeling like I discovered something new. I love it!